The rainforests of Cross River State, southeast of Nigeria, have been recognised for many years as being globally important for their exceptional diversity. The state also contains more than half of the remaining 10% of Nigeria’s tropical forests. With one of the highest rates of deforestation in the country, the government decided to develop a national REDD+ programme in 2009. This was to be a two-track process: the development of a national REDD framework and a more “grounded” framework to be piloted at the state level in Cross River state (one of 36 states in the country). The process of implementing REDD by the Cross River state involved a task force embedded within the Forestry Commission with the mandate to enforce a moratorium on all logging activities. Without any adequate consultation with the directly affected populations, the task force has been harassing communities that have depended on the forests for generations (1). Cross River state is also part of the “Governor’s Climate and Forests Taskforce”, which aims to establish REDD carbon trading between 29 states and provinces from Brazil, Indonesia, Ivory Coast, Mexico, Nigeria, Peru, Spain and the United States.In parallel with the development of the National REDD programme, the government of Cross River state announced in 2009 a 3-year moratorium on all logging to give the state time to plan for the “wise” use of its forests, which was then extended indefinitely. As one might imagine, the logging ban was highly unpopular and very controversial indeed. It is debatable whether it actually took the pressure off the forests and certainly generated a great deal of resentment and tension between the government, communities and small-scale loggers. The moratorium meant a complete ban on woodcutting in all forests, including those not delineated as reserves by the state or federal government, affecting local livelihoods that depended on the wood and timber resources. In the meantime, Nigeria was awarded through the United Nations “forest carbon scheme” (UN- REDD) a USD$4 million grant to define its REDD programme. Part of this grant went to the Federal Government and part to Cross River State, as this was the pilot state for the country. After 7 years, it’s hard to see what impact, if any, these funds have had. 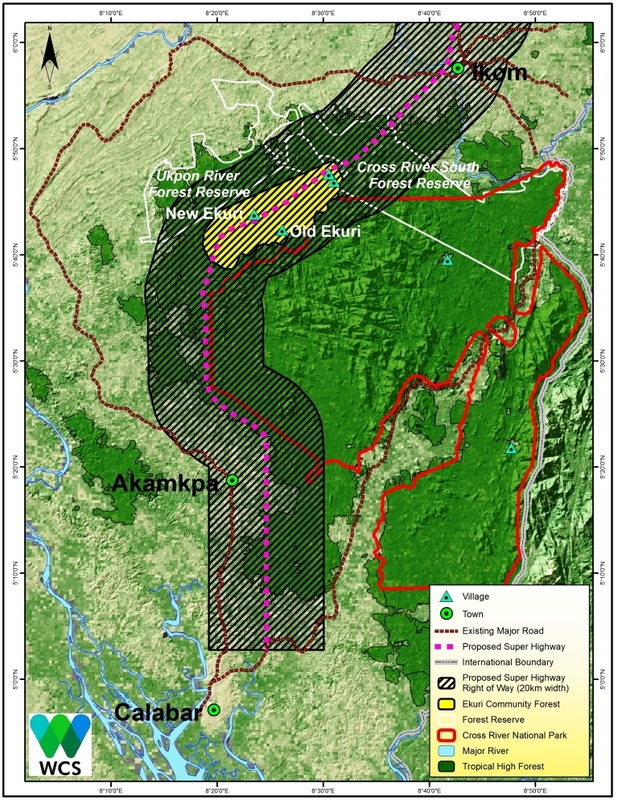 As research from the Nigerian NGO Social Action points out, “forestry laws of Cross River State, which were derived directly from British colonial era laws dating back to 1956, empowers the state government to constitute forest reserves and declare areas as protected forests under state control… All that is needed is for local government and chiefs to be notified. Following such notice, government agents are empowered to prohibit collecting of any forest produce at short notice. In addition, the Land Use Act, which was promulgated as a military decree in 1978, vests all land comprised in the territory of each state in the governor of that state. This Act overrides all communal and customary titles. It was with the combination of the forestry and land laws that the Cross River State Government created the framework for REDD” (2), without actually establishing any new legal structures or institutions. With the recent elections in Nigeria, a new Governor has come to power in Cross River State, Senator Ben Ayade. Within a matter of weeks, the Governor wasted no time in stating publicly that the UN-REDD process needed to be “re-examined”. He said that he openly disagreed with the need to conserve old growth forest and wanted to move towards forest “management”, so that old trees could be cut down “since young ones sequester carbon more quickly”. In the same space of time, the Governor lifted the logging moratorium and gave the state’s forestry commission targets for the amount of revenue they had to generate for forest logging to contribute to the state’s finances. At the same time, he has flagged off a project to construct a 260 km long superhighway, right through the middle of the state’s rainforests and through the middle of forestland belonging to over 40 communities. On the 22nd of January, he also announced that all land within 10 km at either side of the highway was being acquired “in the over-riding public interest”. So almost overnight he made over 40 forest dependent communities technically landless and homeless. Furthermore, the highway will pass right through the middle of all 3 of the proposed REDD pilot sites in the state. So the REDD programme is all but dead effectively. This superhighway will obliterate the entire 33,600 ha Ekuri forests, destroying the way of life of these forest communities forever and leaving them homeless. As one can imagine, forest communities are outraged. It is ironic to see how fast REDD means no protection for forests as soon as “better investment” (from the government’s perspective) comes in. Not only does the highway make communities landless, but also it is well known that once the forest is opened up, illegal loggers, migrant farmers and hunters will flood in and the forest will be gone in no time. Local communities have stated that there is no need at all for the planned highway and are now working with a coalition of national and international NGOs, including the WRM, to fight the superhighway which threatens their very existence. It is ironic, a logging moratorium and REDD programs were put in place to restrict the perceived threat to the forests from communities’ traditional forest use and small-scale logging. But now, the real threat to the forests has appeared in the form of a government-backed superhighway and the rights of Nigeria’s forest people are threatened as never before.